Rob Evan - Rocktopia – On Tour This Spring! Rob Evan is a highly accomplished actor, singer, and producer with more than 20 years of professional experience in the entertainment industry. Rob is a member of the multi-platinum-selling band, Trans-Siberian Orchestra. He can be heard on TSO’s “The Lost Christmas Eve” (Certified Double Platinum – Lava/Atlantic) and their latest release, “Nightcastle”, which debuted at #5 on Billboard’s Top 100 (currently certified Platinum – Atlantic Records). Rob has toured Europe and the US with Trans-Siberian Orchestra as Beethoven in TSO’s rock opera, “Beethoven’s Last Night.” Rob has opened for and performed with Sir Elton John, Trisha Yearwood, Linda Eder, Phil Collins, REM, Bonnie Tyler, John Cougar Mellencamp, Joe Walsh, Usher, Michael Crawford, and many others. He was also the lead vocalist for Jim Steinman’s “The Dream Engine” and recently released the debut album from his progressive rock band, Menrva Realm. 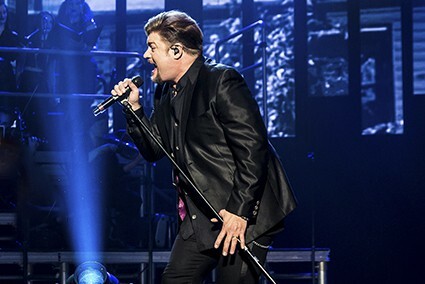 See Rob live in concert with Rocktopia when the classic rock and classical music fusion show comes to your town! Check out upcoming tour dates, here.